Leaving London we head north to the UK’s third largest city that has one of the most diverse and respected retail repertoires and was voted the number one shopping city in the UK by the Rough Guide. 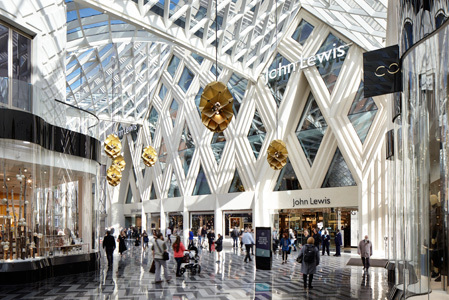 Leeds serves 1.9 million consumers living within a 30 minute drive of its centre, boasts eight indoor shopping malls, over 1000 stores and now has four of the UK’s leading department stores – Debenhams, Harvey Nichols, House of Fraser and John Lewis - residing at its heart. Located amongst the markets, close to the coach station, Victoria Gate brings another shopping dimension to this northern gem. From high street at Trinity Leeds in the west to high end at the new designer development in the east, Leeds offers an array of shopping to suits all tastes and budgets. Victoria Gate not only opens up the shopping districts across Leeds, but also brings many new brands to this wealthy, cosmopolitan city. Anchored by the largest John Lewis outside London, the new development is rich in texture and relief and brings a sense of order and rhythm to this stylish, new mall. 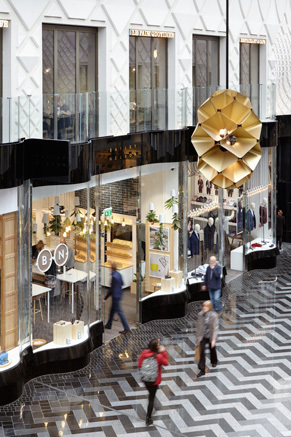 Absolutely stunning both inside and outside, Victoria Gate drew inspiration from the city’s rich, mercantile past. The architects, Acme, took the lead and created an incredibly tactile and very three dimensional building. Based upon the patterns present in textile itself, the architects have fused ornate stone, brick and metalwork with an array of colour to create the magnificent structure. 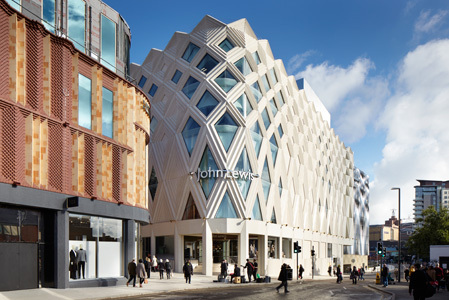 The diagrid facade of the John Lewis store, built from very sculptural stone is incredibly striking. A set of pilasters, starting vertically and leaning slowly as the columns rise to form a changing pattern are broken up with windows to allow daylight into the building. Further along, a three-dimensional brick and terracotta elevation is pleated to create a multitude of shadows and depth across the building. Brass and rust coloured metals have then been applied at higher levels to create a palette of complementary materials in the traditional Leeds terracotta colours. Finally, the multi-storey car park exterior also takes references from the diagrid pattern of the department store and the facade is made up of hundreds of twisting aluminium fins. These fins are spaced to allow natural ventilation and create an ever-changing pattern of light, shadow and reflections. Inside the new centre it is even more flamboyant! It’s a thoroughly twenty-first century take on the splendour and grandeur of the Victorian arcades and the great, nineteenth century European shopping malls. The gigantic glass and steel roof above is just as detailed as the three dimensional exterior patterns and assumes a similar style. It rises and falls above the shops and forms a large, spacious canopy set a whopping 22 metres above the square, at the entrance to John Lewis. As such the entire complex is flooded with natural daylight giving a feeling of openness that is quite unique in an enclosed shopping centre. A string of ornate pendant lanterns are suspended from the intricate roof. An art form themselves, they are created from gold coloured metal welded together to form an open flower. The lanterns add a touch of glamour to the bold, architectural roof. The arcade is highly spacious and opulent. Elegant, curved glass shop fronts line the avenues, echoing their Victorian predecessors. The storefronts are streamlined all having gloss black headers and footers plus refined, gold lettering as signage – very tasteful indeed. The stone floor is yet another significant feature, created from 15 shades of sparkling grey tiles arranged in a herringbone pattern and pays homage to the textile heritage of this area. 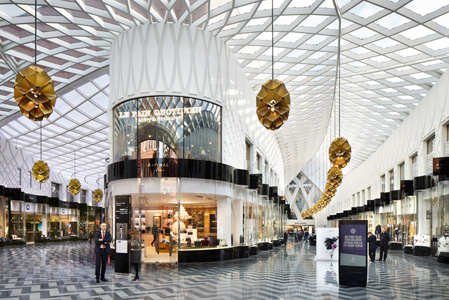 Glitzy and glamorous, suave and sophisticated the new mall is well placed to serve the well heeled of Leeds and brings an array of luxury boutiques debuting in Leeds - Anthropologie, Aspinal of London, Calvin Klein, Gant and Ghost to name a few. Not forgetting the staggering new John Lewis set over five floors including a rooftop restaurant. It is currently the largest outside London and the new Northern flagship for this middle market leader; and rightly so for the store is beautifully merchandised with a statement feature in every department. The emphasis here is on quality and service which perfectly mirrors the aspiration of this fabulous new shopping destination. It is simply stupendous.